The 2018 U.S. Fashion Industry Benchmarking Study is now available. While the majority of respondents remain confident about the five-year outlook for the U.S. fashion industry, the percentage of those who are “optimistic” or “somewhat optimistic” dropped to a record low since we began conducting this study in 2014. This change could be due to concerns about the “protectionist trade policy agenda in the United States” and “market competition in the United States from e-commerce,” the top two concerns this year. The percentage of those who are “optimistic” or “somewhat optimistic” fell from 92.3 percent in 2016 to 71.0 percent in 2017, a record low since we began conducting this study in 2014. As many as 12.9 percent of respondents are “somewhat pessimistic” about the next five years, mostly large-scale retailers with more than 3,000 employees. Despite the challenges, demand for human talent in the industry overall remains robust. This year, around 80 percent of respondents plan to hire more employees in the next five years, especially supply chain specialists, data scientists, sourcing specialists, and marketing analysts. Cost is no longer one of the top concerns; respondents are less stressed about “increasing production or sourcing cost,” which slipped from #2 challenge in 2016 to #7 challenge in 2017. Only 34 percent rate the issue among their top five challenges this year, significantly lower than 50 percent in 2016 and 76 percent in 2015. Labor cost remains the top factor driving up sourcing cost in 2017. Although U.S. fashion companies continue to seek alternatives to “Made in China,” China’s position as the top sourcing destination remains unshakable. Meanwhile, sourcing from Vietnam and Bangladesh may continue to grow over the next two years, but at a relatively slow pace. 91 percent of respondents source from China; while 100 percent sourced from China in our past three studies, China is still the top-ranked sourcing destination this year, and the percentage of those expecting to decrease sourcing from the country fell from 60 percent in 2016 to 46 percent this year—and many more expect to maintain their current sourcing value or volume from the country in the next two years. Likely reflecting the United States’ withdrawal from the Trans-Pacific Partnership (TPP) and the expectation of increasing labor costs, only 36 percent of respondents expect to increase sourcing from Vietnam in the next two years, much lower than 53 percent who said the same in 2016. Respondents are cautious about expanding sourcing from Bangladesh in the next two years, with only 32 percent expecting to somewhat increase sourcing While “Made in Bangladesh” enjoys a prominent price advantage over many other Asian suppliers, respondents view Bangladesh as the having the highest risk for compliance. 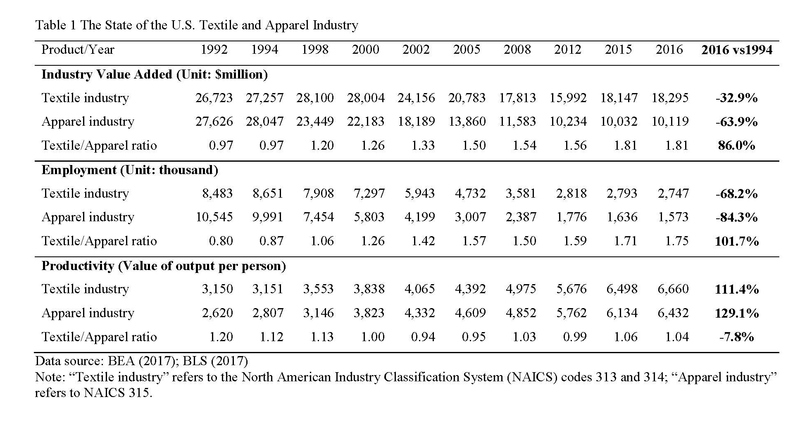 U.S. fashion companies continue to maintain truly global supply chains. Respondents source from 51 countries or regions in 2017, close to the 56 in last year’s study. 57.6 percent source from 10+ different countries or regions in 2017, up from 51.8 percent in last year’s survey. In general, larger companies have a more diversified sourcing base than smaller companies. Additionally, retailers maintain a more diversified sourcing base than brands, importers/wholesalers, and manufacturers. Around 54 percent expect their sourcing base will become more diversified in the next two years, up from 44 percent in 2016; among these respondents, over 60 percent currently source from more than 10 different countries or regions. The most common sourcing model is shifting from “China Plus Many” to “China Plus Vietnam Plus Many.” The typical sourcing portfolio today is 30-50 percent from China, 11-30 percent from Vietnam, and the rest from other countries. While Asia as a whole remains the dominant sourcing region for U.S. fashion companies, the Western Hemisphere is growing in popularity. This year, we see a noticeable increase in sourcing from the United States (70 percent, up from 52 percent in 2016) and countries in North, South, and Central Americas, which offer a shorter lead time and relatively lower risk of compliance. Today, ethical sourcing and sustainability are given more weight in U.S. fashion companies’ sourcing decisions. Respondents also see unmet compliance (factory, social and/or environmental) standards as the top supply chain risk. 5 percent of respondents say ethical sourcing and sustainability have become more important in their company’s sourcing decisions in 2017 compared to five years ago. 100 percent of respondents currently audit their suppliers, including how suppliers treat their workers, suppliers’ fire safety, and suppliers’ building safety. The majority (93 percent) use third-party certification programs to audit, with a mix of announced and unannounced audits. As many as 90 percent of respondents map their supply chains, i.e., keep records of name, location, and function of suppliers. More than half track not only Tier 1 suppliers, suppliers they contract with directly, but also Tier 2 suppliers, i.e. supplier’s suppliers. It is less common for U.S. fashion companies to map Tier 3 and Tier 4 suppliers though, which could be because of the difficulty of getting access to related information with such a globalized and highly fragmented supply chain. Free trade agreements (FTAs) and trade preference programs remain underutilized, and several FTAs, including CAFTA-DR, are utilized even less this year than in previous years. 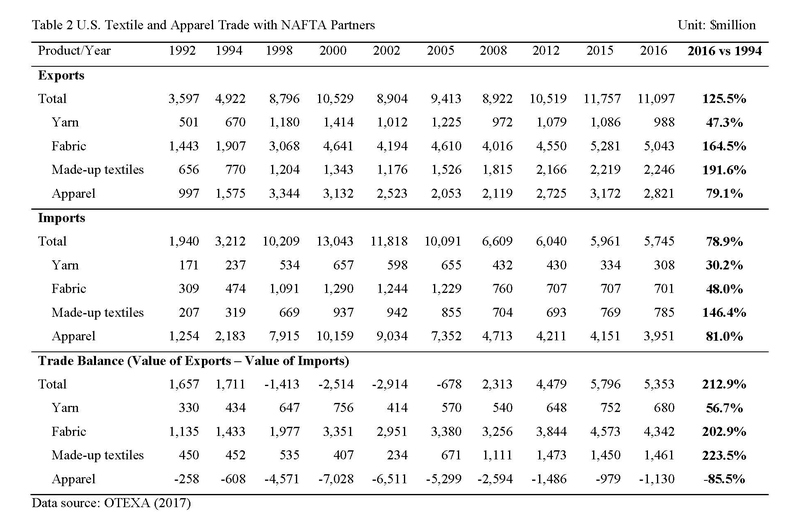 Of the 19 FTAs/preference programs we examined this year, only NAFTA is used by more than 50 percent of respondents for import purposes. 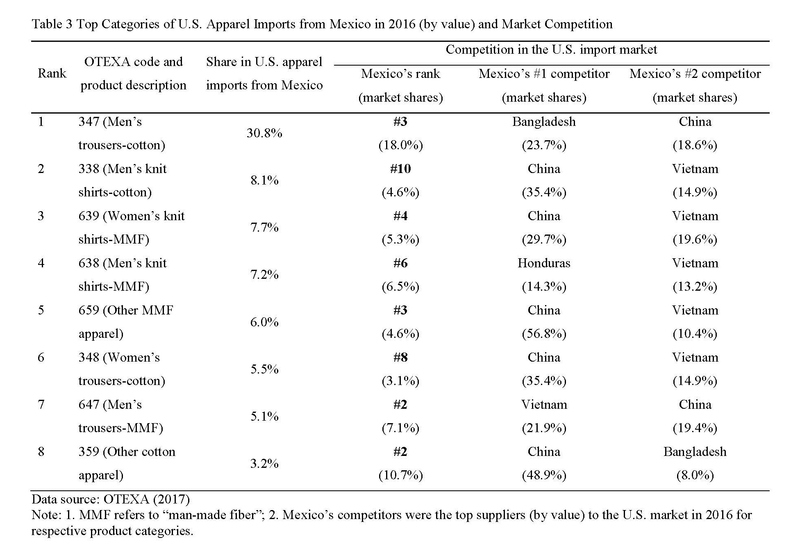 Even more concerning, some U.S. fashion companies source from countries/regions with FTAs/preference programs but, for whatever reason, do not claim the benefits. 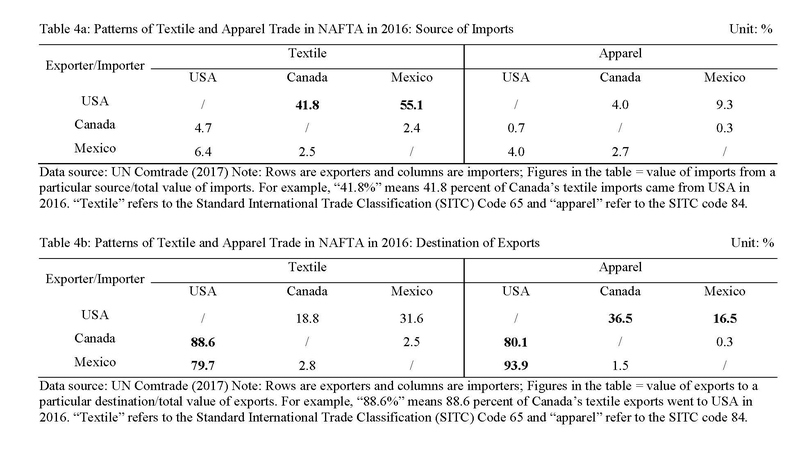 For example, as many as 38 percent and 6 percent of respondents, respectively, do not use CAFTA-DR and NAFTA when they source from these two regions. Respondents unanimously oppose the U.S. border adjustment tax (BAT) proposal and call for the further removal of trade barriers, including restrictive rules of origin and high tariffs. 100 percent of respondents oppose a border adjustment tax; 84 percent “strongly oppose” it. Respondents support initiatives to eliminate trade barriers of all kinds, from high tariffs to overcomplicated documentation requirements, to the restrictive yarn-forward rules of origin in NAFTA and future free trade agreements. Respondents say the “complex standards on labeling and testing”, “complex rules for the valuation of goods at customs” and “administrative and bureaucratic delays at the border” are the top non-tariff barriers they face when sourcing today.